4 Attitudes toward dispositions in criminal proceedings, etc. The research subjects were persons who repeated offenses and were imprisoned, and many of them had in the past received dispositions such as being granted suspension of execution of the sentence and placed under probation. Inquiries into how research subjects reacted to these dispositions, etc. was also conducted in this research. First, Fig. 7-3-2-4-1 shows the rate of persons who didn’t care about the period of suspension of execution of the sentence or the parole period, among those who had been granted suspension of execution of the sentence both with and without probation or released on parole for the same type offense as the index offenses in the past. Of those who had been granted suspension of execution of the sentence without probation, more than half had not taken the situation very seriously as they “ didn’t care about from the beginning” or “cared about at first but gradually became less concerned.” This rate was also considerably high for probationers (36.9% of inmates for theft, 50.0% of inmates for stimulants) and parolees (21.3% of inmates for theft, 22.2% of inmates for stimulants). Next, Fig. 7-3-2-4-2 shows how persons who had been placed under probation/parole supervision for the same type of offense as the index offenses in the past evaluated their compliance with conditions for probation/parole supervision and life and conduct guidelines. The rate of persons who answered “couldn’t comply” was about 20% of parolees but over 50% of probationers. Fig. 7-3-2-4-3 shows responses concerning reasons for “couldn’t comply” by persons who answered so. Fig. 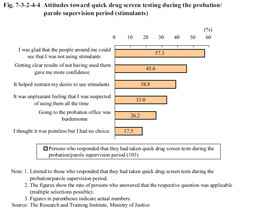 7-3-2-4-4 shows attitudes toward quick drug screen testing among persons who had taken such a test during their probation/parole supervision period for Stimulants Control Act violations. The number of positive impressions was high, and included “I was glad that the people around me could see that I was not using stimulants” (57.3%), “getting clear results of not having used them gave me more confidence” (45.6%), and “it helped restrain my desire to use stimulants” (38.8%), in that order. Negative/passive impressions were also included, such as “it was unpleasant feeling that I was suspected of using them all the time” (33.0%), “going to the probation office was burdensome” (26.2%), and “I thought it was pointless but I had no choice” (17.5%).